I first got into bread during a long, cold winter living up in Vermont. With not enough money to buy a ski pass and too much time just trying to stay warm by the wood stove, I started baking. I started with basic recipes- whatever I could find in the old recipe books sitting on the shelves. When I moved back to R.I. 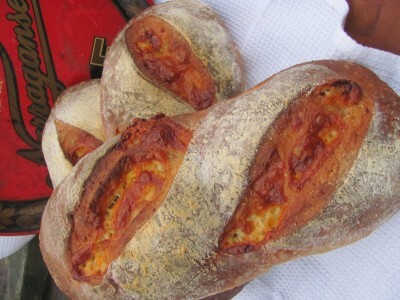 I started baking and selling my bread and pastries at the Charlestown Farmer’s Market. 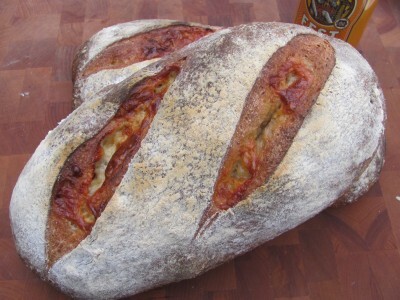 That’s when I started really getting into it, and that’s where the cheddar beer bread was born. I couldn’t make enough of it! I always use ingredients that I can be proud of and I like to buy local when I can, so I began baking the bread with Narragansett Beer. I started with the porter because it gave the bread incredible flavor and color. Sadly I discovered that the porter is seasonal, but thought, what the heck, I’ll change with the seasons! Now I use the porter, fest, summer and bock. During the summer I still sell my bread at the Charlestown Farmer’s Market and all year round at Grapes and Gourmet in Jamestown, RI. In a large bowl, combine the flours, yeast and salt. Add the cottage cheese and mix until evenly distributed. Add beer and mix with hands or spatula until a shaggy ball forms. Move the dough to a floured work surface and knead for about 7 minutes (you may need to add more flour). The dough should be tacky, not sticky, when touched. Place the dough in an oiled bowl and cover with plastic wrap. Allow to rise for about an hour or until doubled in size. Punch it down and allow to rise for another 45 minutes. Divide dough into two pieces, loosely formed into balls . Working with one piece at a time, form into a rectangle 8 inches by 6 inches. Sprinkle the rectangle with cheddar and tightly roll the rectangle starting from the short end. Seal the dough and place on a sheet pan that has been sprinkled with corn meal. Spray with oil, cover, and allow to rise for 1 to 1&1/2 hours. When the loaves are ready to bake, sprinkle with flour and make two slashes down the bread at a slight angle. Be sure to cut deep enough to reach the cheese so that it oozes when baked. Bake in a preheated 400 degree oven for about 1/2 hour or until the top is a deep brown and the cheese is melty and crispy ( if you used the porter your bread will automatically be darker in color, so be aware of this when you are checking for doneness). When you remove the finished bread from the oven, allow to cool on a rack for 10 minutes. This bread is most delicious served warm. on Isis’s Cheddar Beer Bread And Story. this recipe has a measurement problem related to the liquid content. 1 and 1/2 beers seems to be too much liquid a measurement in ounces would be nice. also if the flour used is scooped and unsifted this should be noted, because at the volume used this would make a difference of over one cup.